Joe Hagedorn is an account executive of Rich & Cartmill, LLC. Joe is married to Linda Lorch and they have two daughters, Claire and Elizabeth. While attending Indiana University Southeast, Joe worked for a car dealer in the parts department and as an assistant body shop manager. In 1978, he had the opportunity to help his father establish Hagedorn Auto Body Repair Shop, Inc. Over the next 38 years, Joe guided the business as it evolved to Hagedorn Collision Center, LLC. 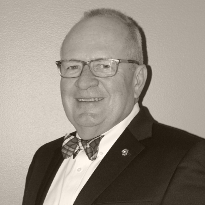 Aside from being an auto aficionado in his downtime, Joe is an involved community leader and served on the Rauch Inc. President Advisory Council and is currently a Floyd County Head Start board member. He also is an active member of Rotary International and coordinated three international sanitation/water projects in Nepal, Mexico, and an orphanage in Uganda. Most recently, Joe served as coordinator for the Rotary of New Albany Centennial Water Fountain Project for the City of New Albany Centennial Park. Joe served as Rotary District Governor 2012–13 and continues to serve Rotary International both locally and regionally.